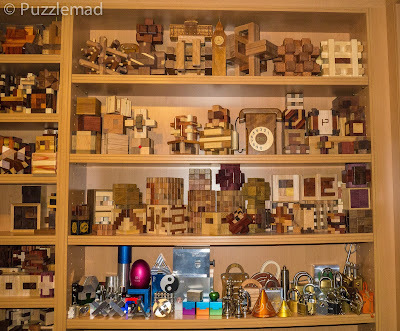 PuzzleMad: Some You Win, Some You Lose! In Fact, I Seem To Lose Most Often! Kumiki Airlines - something not quite right here??? I do hope you are grateful? This will be my only weekend off work for 3 weeks and I am sitting still here writing a blog post for you...even when it is an absolutely gorgeous day outside! Mrs S is talking on the phone to the Mother-outlaw and I am trying to keep out of the way so that she might forget the chores she said I had to do! Whack! Ouch! Ooops - I guess she hasn't forgotten. 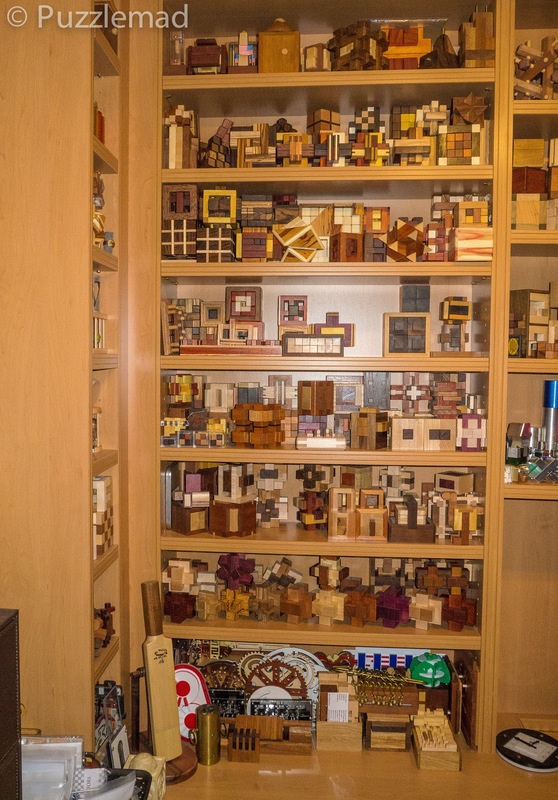 I have been so busy at work and at home recently that I have barely managed to work on any puzzles at all and surprisingly not received anything new for a few weeks! My last little splurge was described here. 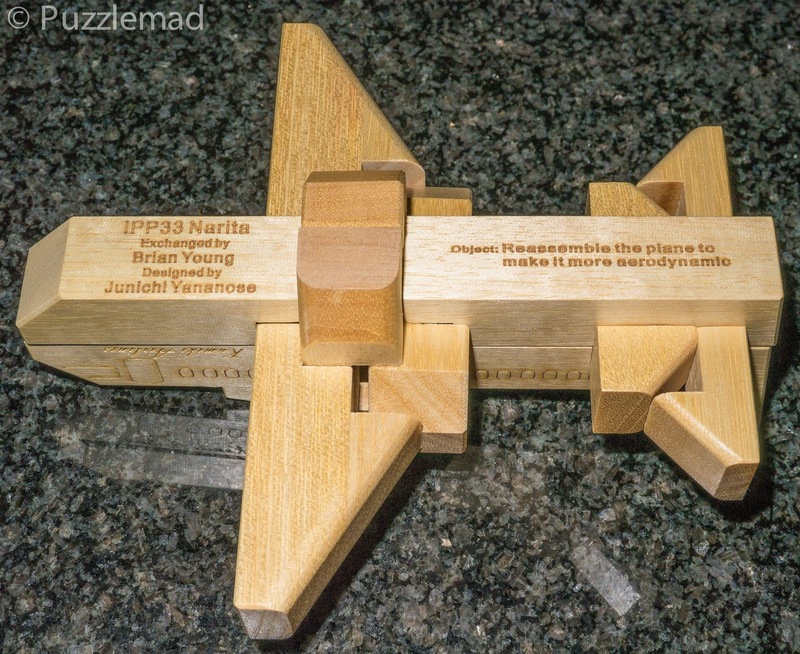 Today's story is about a little success and a whole lot of failure - I began with the Kumiki Airlines puzzle which I finally bought after several years of longing from Brian and Sue Young's MrPuzzle store. I had originally seen this years ago when Allard showed it off at an MPP and wrote about it on his blog back in December 2013. 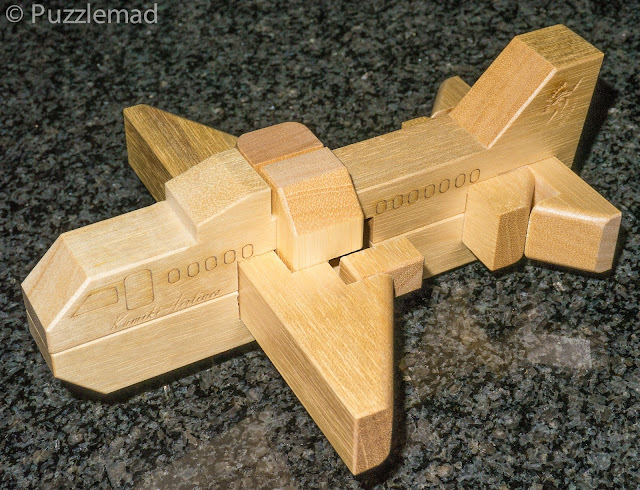 "The plane is incorrectly assembled and can’t possibly fly like this. You need to take the puzzle apart and reassemble it to make it more aerodynamic. To do that on reassembly you’ll have to solve the level 13.4 multiple move burr." The base of the puzzle with instructions. Brian rates this puzzle as 8/10 difficulty. The first thing that sprung to mind to me was that it didn't look like it would fly in the form that was sent out and the first thing that sprung to Mrs S' mind was that it was "cute". I can live with that! Of course, I had forgotten the description which included the word "burr"! 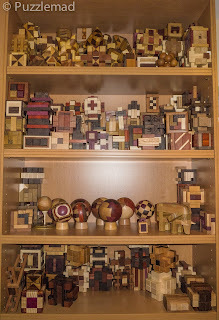 I only remembered the Kumiki word and only thought of the simple little plastic Kumiki puzzles I had played with as a kid. I couldn't resist and set to as soon as my photos had been taken. There are a couple of possible moves at first including a possible rotation which I tried to avoid. 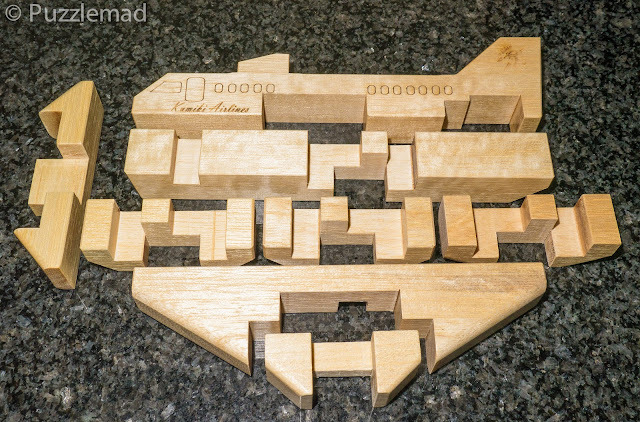 Within about 2 minutes with only 3 or 4 experimental moves, the puzzle split in half lengthways and crash-landed on the kitchen work surface before shooting in pieces all over the place! Well, that bit was easy! Having achieved the rather simple separation of the pieces, I immediately tried to reset the puzzle back to the beginning and was a little surprised to realise that I could not do it easily! I had to go and sit down at a table and work on it! The thing fell apart in 2 minutes flat and it took me about 15 minutes to reset! At least I was able to put it back to the beginning...the full solve was just a different orientation of the pieces - it couldn't possibly be that hard...could it??? Stupid boy! Brian's rating was absolutely correct - this is a difficult puzzle, at least for me. Initially, I set to attempting the proper aerodynamic assembly in the same way as the false start and of course, that was wrong. Put this down to lack of experience of Kumiki puzzles and me not being terribly bright! You might ask, "is this just a huge matter of trial and error until you find the correct burr piece positions and then assembly method? And...the answer to that is a most definite NO! I dare say that you might be able to do this by pure trial and error but that would be horrifically boring and definitely not in the spirit that was intended by either Juno or Brian. This puzzle has enough to be seen in the pieces that the assembly can actually be worked out by logic. I know! I can hear you muttering now that the fool is no good at logic and doesn't stand a chance! Damn those voices! I probably should see someone about them. All I can say with this is AHA! 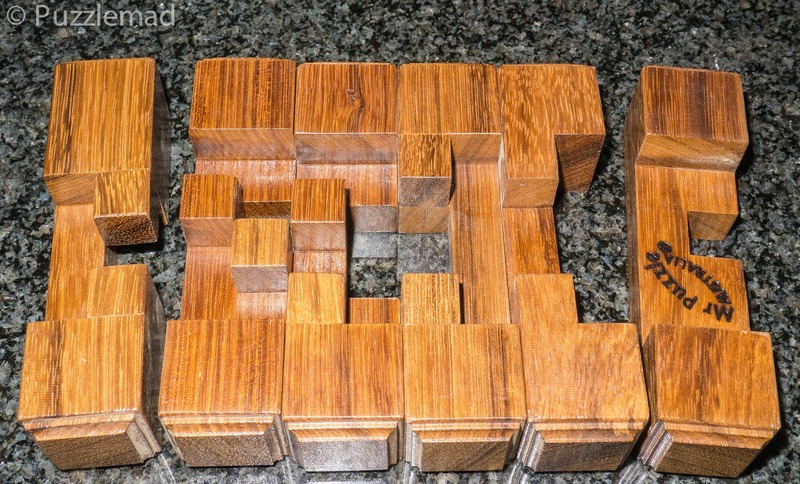 I simply ADORE THIS PUZZLE! It really is a Kumiki assembly puzzle and only has a very limited likeness to a burr. If you are not a burr person then you would still LOVE this challenge. It is very solvable and most definitely NOT one for trial and error. There is a real pathway of discovery during the exploration and eventual success that gives enormous satisfaction - every single piece and cut in the wood has been placed deliberately and paying attention to them will lead you toward success. I am sure that if you were desperate then you could model it in Burrtools but the presence of fractional height cuts make this a bugger to model. Buy it! 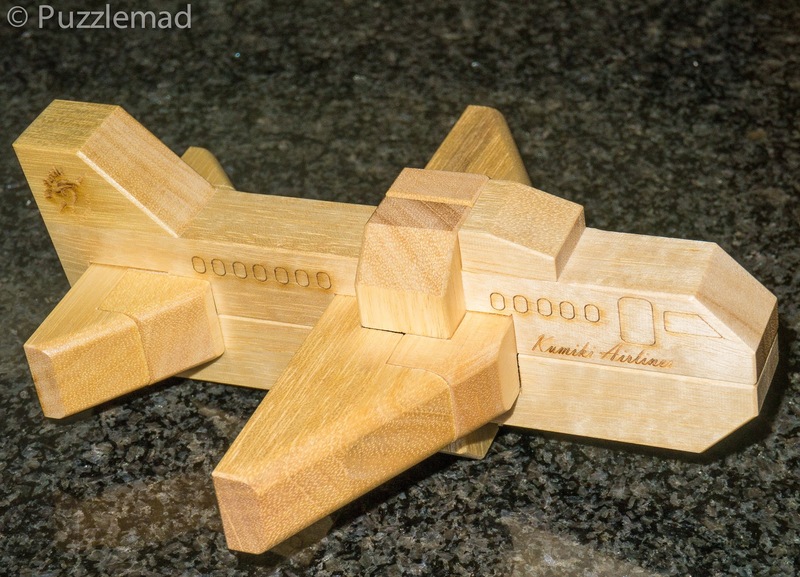 It's not terribly expensive and you'll have an airplane on your shelf once it's done! By the way...Allard loved it too! Despite being a burr-lover, I only have 2 standard 6 piece burrs in my collection - the Piston burr made by the amazing Jerry McFarland and the Computer's choice unique 10, also made by Jerry but designed by the incredible Bill Cutler. I also have a number of very special burrs that look like standard six piece burrs in my collection but in reality, have rather unusual and special solutions which are a lovely challenge and then I have 3 burr sets (you will see these in a photo at the end of my post) which provide many hundreds (or thousands) of burr assembly challenges. I am simply rubbish at burr assemblies. I thought a while ago that if I start at the simpler level 1 challenges and move up gradually then I would start to get better...I was wrong, I am still rubbish! Quite a few years ago Nigel had told me in words of one syllable that the Mega six puzzle is fantastic and that I MUST get it. I used my recent splurge as an excuse to get a hold of a copy. 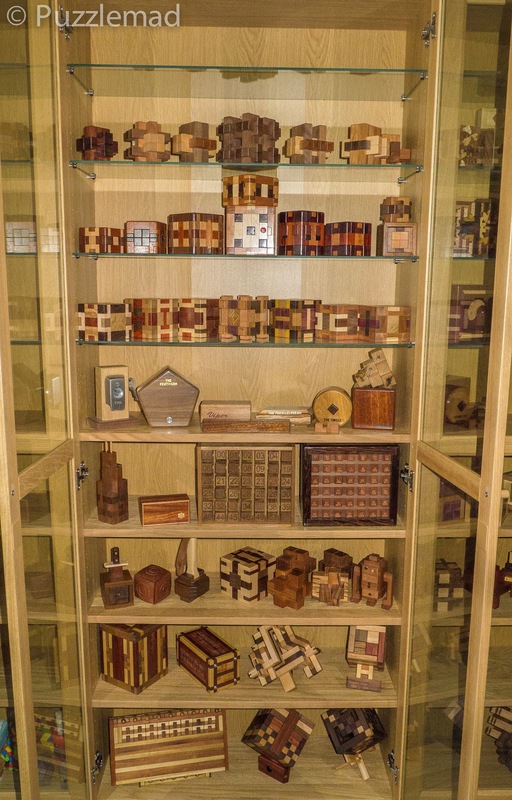 If you aren't bothered about the gorgeous wood then Brian also has a version in a standard wood for less moolah. I, of course, bought the version made from Queensland Blackbean because I'm a sucker for gorgeous wood! "This puzzle really does show a case of 'don't judge a book by it's cover'. It may look like other six piece burrs on the outside but it is DEFINITELY not. 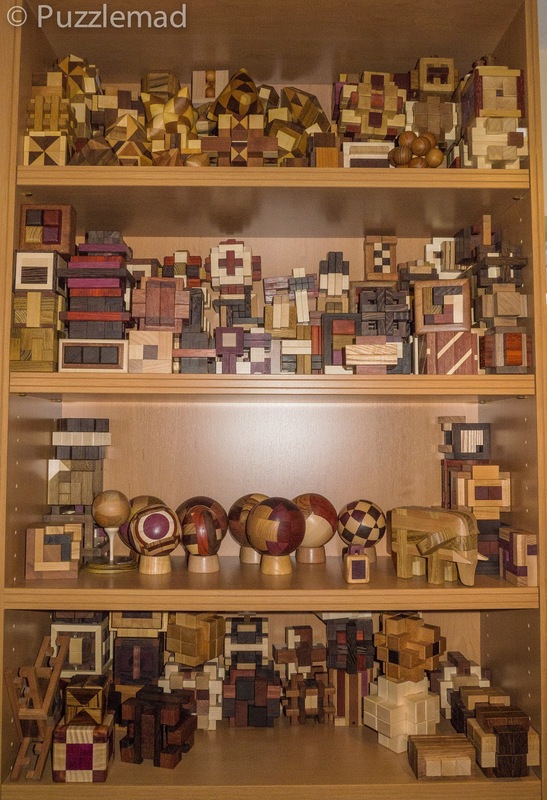 The puzzle is incredibly more complicated than the commonly known six piece puzzle. Bill Cutler first used a computer program to analyse six piece burrs in 1974 but it took until 1990 to analyse all possible six piece burr combinations. Mega Six is the result of that search for the maximum number of moves for a six piece burr with a unique solution. This does not mean it has a unique assembly, due to the number of internal voids. 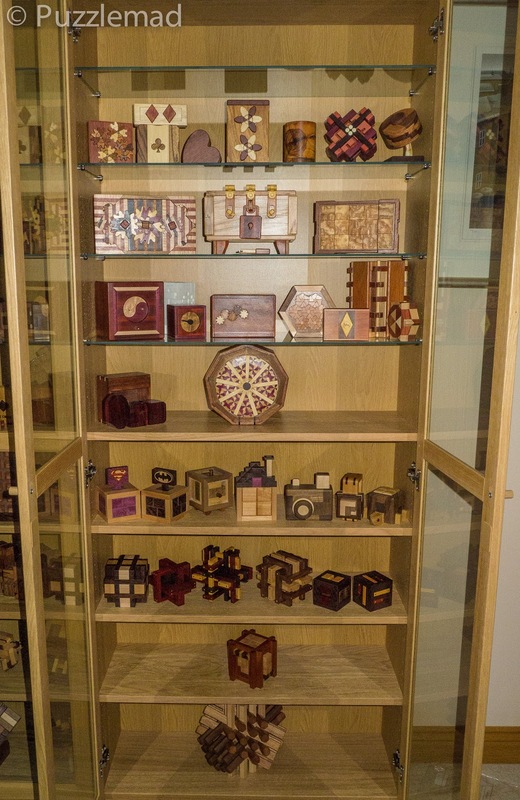 In theory the pieces should fit together in 20 different ways however, the reality is that you can physically only put the puzzle together in one of the 20 assemblies. Not only OUR hardest six piece burr but THE hardest six piece burr!" OMG! Let's just say that I have been working on this on and off ever since I finished the Kumiki Airlines and have so far made no headway at all! I'll keep at it but may get sidetracked by other toys along the way! This one I have definitely not won - I won't say lost yet but it might be years! Thanks, Nigel! I also lost a fight! "She who threatens unspeakable injury upon my person" got very very fed up with the state of my desk in my study! I did say that she never has to go in there herself but that only gained me a Whack! Ouch! and a Laser burning stare - yeeeouch! 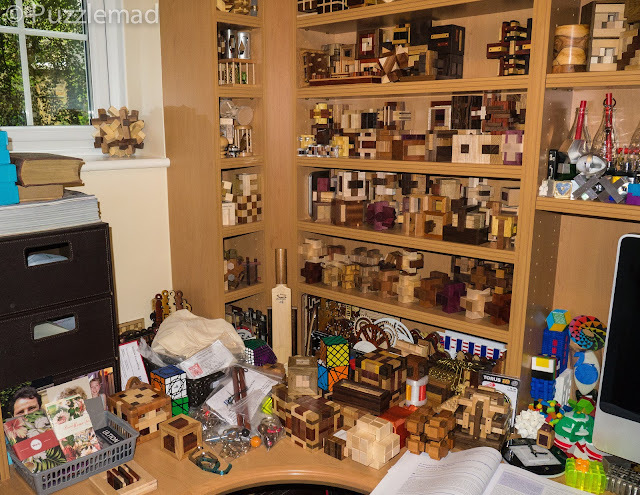 I took a photo of the desk - what do you think? 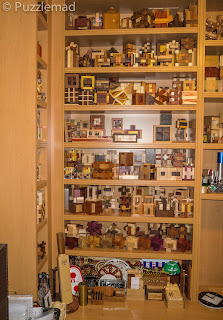 My precioussss - Can you work out what they are or who made them? It's only the beginning but I would appear to have plenty of space for new toys! The desk and the rest of the study looks great and I have even managed to take a load out of the dining room and living room. I now have an almost placated Mrs S... FLINCH! Even some space above the iMac! 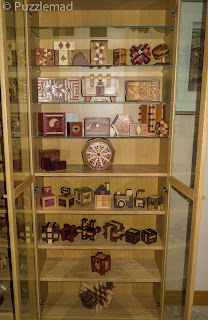 I'd better not tell Mrs S that a puzzle is due to be posted from Azerbaijan tomorrow! Whack! Ouch! don't you have a lot of dust because of the open-air cabinets? I have a bit but surprisingly little. The roomthat they are in is mostly kept closed. He has a Sick Sick Mind!